The NT-505 is a flagship dual monaural USB DAC with versatile network playback capabilities. It successfully incorporates the latest network technologies, along with TEAC's decades of accumulated audio design experience, in an attractive package with an A4-sized footprint. The analogue section, which is one of the keys to sound quality, includes four TEAC-HCLD buffer amp circuits that allow different drive modes, - fully-balanced drive for balanced output, and parallel drive mode for unbalanced output - to achieve enhanced acoustic expression. On the network audio side, the NT-505 supports high-quality music subscription services, namely TIDAL and Qobuz, and is Roon Ready. There's also a built-in MQA decoder, and you will enjoy unlimited music content on the Internet thanks to its high-quality digital and analogue processing technologies. The NT-505 is a compact and high-spec USB DAC and network player that supports the latest Hi-Res formats and online music subscription services. *1 "Bulk Pet"� is a registered trademark of Interface Corporation. The NT-505 employs the latest VERITA AK4497 (developed by Asahi Kasei Microdevices) on each of the left and right channels. It is a highly-regarded high-end audio DAC, and supports DSD512 (22.5MHz) and 768kHz/32-bit PCM formats, achieving industry-leading ultra low distortion levels. OSRD (Over-sampling Ratio Doubler) technology, meanwhile, significantly reduces out-of-band noise. As a result, the NT-505 has the refinement necessary to make the most of Hi-Res formats, successfully processing information that lies outside the audible range. * The AK4497 is the flagship product of the Asahi Kasei Microdevices Audio4pro™ family, which has been developed for professional audio equipment and high-end digital audio. A dual monaural circuit configuration is used throughout, from the power supply (including power transformers), to the D/A converters in the digital section and the analogue output stage. From the high-performance VERITA AK4497 D/A converters to the massive toroidal-core power transformers, each element is configured for single channel processing. This prevents mutual interference effects while reproducing a rich acoustic expressiveness. In addition, the analogue audio signals of both the left and right channels are processed in full balanced mode soon after the D/A converters all the way to the output terminal, contributing to an improved S/N ratio and extended dynamic range. This allows the fantastic sense of air that Hi-Res formats possess to be processed and conveyed without any losses. Connecting to your home network via a LAN cable, the NT-505 allows you to access Hi-Res music libraries on available music servers and computers, as well as hundreds of millions of CD-quality tracks on Internet via music subscription services like TIDAL and Qobuz. The NT-505 is also a Roon Ready product that enables Hi-Res audio streaming thanks to its high-performance D/A converters. *Roon Ready is scheduled to be deployed in the near future. In order to achieve an analogue waveform closer to the original signal, the NT-505 supports MQA decoding while also supporting high sampling rate Hi-Res formats like DSD512 and PCM32/768. The MQA decoder is a totally new technology that controls analogue waveforms with excellent precision (as fine as 5 microseconds) and it reproduces sound in a manner that is perceived to be as close as possible to the original (to human hearing). Furthermore, a high-efficiency compression algorithm makes huge Hi-Res audio files compact in size, so you will be able to enjoy Hi-Res audio sources regardless of the speed of your Internet connection. "�*MQA Ready is scheduled to be deployed in the near future. In addition to conventional SBC and AAC codecs, the NT-505 also supports LDAC™ (24/96 Hi-Res audio transmission), and Qualcomm® aptX™ HD, a codec that uses 24/48 format transmission. These allow you to playback playlists on your smartphone and tablet wirelessly. The USB port on the front panel allows you to playback Hi-Res audio formats including DSD128 (5.6MHz) and PCM 24/192. Instead of referencing to an unstable and noisy PC clock during USB audio playback, a more accurate and on-board clock is generated by a high-precision, low phase-noise, audio-grade crystal oscillator for USB asynchronous transfer mode. The NT-505 accommodates two on-board clocks exclusively for 44.1kHz and 48kHz sampling frequencies and applies the appropriate one to incoming digital signals - those that are multiples of 44.1k or 48k - to reproduce identical sound to the original by eliminating jitter effects on the audio signal. In addition, an external 10MHz clock input is also provided, to synchronise with an even higher-precision master clock generator, such as the TEAC CG-10M, for yet further upgraded audio playback with excellent sound quality. Employing RDOT-NEO (Refined Digital Output Technology NEO), a fluency algorithm that renders digital audio signals smoothly, the NT-505 up-converts PCM digital signals up to 384kHz/32-bit PCM and 24.5MHz DSD. With the up-conversion function activated, you will hear an improvement in quality, even with music that you are familiar with. When transferring large volumes of digital data for Hi-Res audio sources through USB cables using conventional isochronous transfer mode, large variations can occur in the processing loads of the sending computer and the receiving USB DAC. This can cause sound to drop out and other problems to occur. However, with our new USB transmission technology - dubbed "Bulk Pet"� - a fixed amount of data is transmitted constantly, levelling out the processing burden on both devices and contributing to stable data transmission. Changing the processing burden on the computer directly affects audio quality so users can select the setting they prefer (from four transmission modes). *"�Bulk Pet"� is a registered trademark of Interface Corporation. For more information about "Bulk Pet,"� please visit the Interface Corporation website. 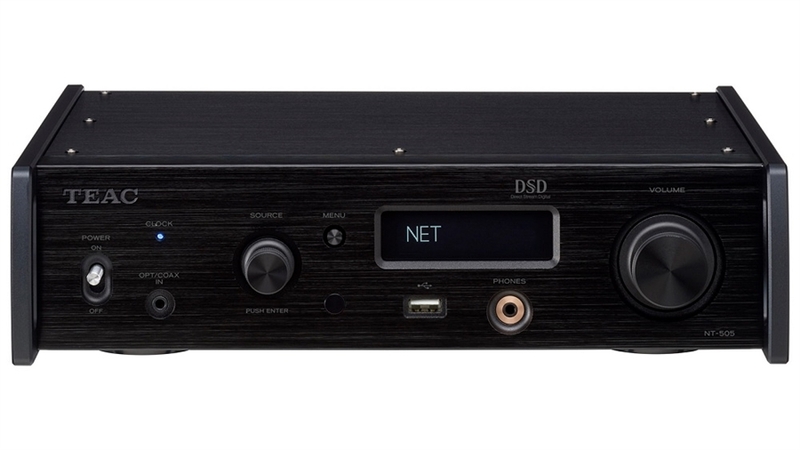 On the NT-505, there are two types of DSD filters and another five types of PCM digital filters, allowing you to apply the filter that best matches the file format or type of music you're listening to. The filter can be changed at the touch of a button on the remote control, allowing you to enjoy the different sonic nuances of each filter. Low Dispersion: Short delay filter with low dispersion that cuts signals outside the audio band. *When receiving signals at 352.8 kHz, 384 kHz or higher, the digital filter will be disabled during processing regardless of the above setting. In order to suppress interference between the digital and analogue sections, the NT-505 employs an independent power supply and ground circuit, so eliminating cross-interference in the signal path where digital and analogue sections connect. A digital isolator is employed at the input section to eliminate noise originating from any connected digital sources, including noise that is generated from the computer via USB, power line and the ground path. This isolation circuit also makes a significant improvement in the signal-to-noise ratio as well as the final sound quality. The dual monaural theme continues. Two over-sized high-capacity toroidal-core power transformers are employed in the NT-505, supplying stable, individual current sources for each of the left and right channels. This means neither channel will be affected by changes in the power consumption of the other during digital processing. At the heart of analogue section are TEAC-HCLD (High Current Line Driver) buffer amp circuits, designed to enhance current supply. Each channel employs two identical buffer amps that process differential drive for balanced output, and parallel drive for unbalanced output. By increasing the current supply to the buffer amp section, the analogue audio signal is passed to the next step without any loss of dynamism. The TEAC-QVCS (Quad Volume Control System) is a precise volume control design incorporated in the pre-amp section. This circuit employs four sets of variable gain-amps controlling volume for left, right, positive and negative (L+, L-, R+, R-). Each variable gain-amp is located on a simplified signal path which helps eliminate interference noise by creating a shorter signal path. In addition, the TEAC-QVCS provides precise volume control in 0.5dB steps in 'dB' display mode, or 100 steps in 'step' display mode. Applying TEAC-HCLD (which comprises four output transistors in each of the left and right channels) for headphone amplification delivers an excellent sound quality via the conventional 1/4"� stereo TRS jack. Furthermore, by driving these transistors in parallel when a single-ended headphone is connected, stronger driving power than conventional single-ended headphone amps provide can be delivered to the headphones. In conventional headphone listening, it is configured to operate in Class-A, despite nominally being a Class-AB amplifier. The NT-505 allows you to bring out the potential of any type of headphones including 600Ω high-impedance examples. Moreover, the ground-separate drive mode completely separates the grounds of the left and right channels from the amp section to the output jacks. Channel separation, which is crucial for headphone listening is significantly improved, achieving a clear soundstage with good transparency. A high contrast full-dot OLED (organic EL display) with 4-step dimmer is employed, for excellent visibility. Even better, a highly legible, large font size allows you to easily verify the volume level, input source and other information, even when sat at a distance. Just as with the successful Reference 503 series, the NT-505 employs aluminum-alloy panels - including iconic side guard-bars - and a robust metal chassis with a compact A4-size footprint* that completely matches with the 500 series and the new CG-10M master clock generator. The full metal construction isn't just beautiful, it's also functional. It's highly effective at isolating the internal circuits from electromagnetic noise. *Not including connectors, knobs and other protruding parts. The NT-505 is equipped with both balanced and unbalanced analogue audio outputs. A pair of XLR connectors and another pair of RCA connectors - each gold-plated - are symmetrically laid out, hinting at the dual monaural arrangement inside, and allowing a wide range of possible audio configurations. A wide-spaced pitch layout for the RCA outputs accommodates professional grade plugs with large-diameter shells. The NT-505 has a total of 5 digital inputs: USB audio, coaxial, optical on the rear panel, and a combination jack on the front panel (for coaxial and optical, supporting PCM 24/192 and DSD64 in DoP format). The next-generation Hi-Res formats, DSD512 (22.5MHz) and PCM 768kHz/32-bit are supported via the TEAC HR Audio Player software for Windows and Mac. This software guarantees the best available playback quality with any combination of audio format and computer configuration via a single USB cable. All the user has to do is choose the NT-505 from the pull-down menu showing target output devices. The TEAC HR Audio Player is downloadable from TEAC's web site, and is completely free to use. * Use on a Windows computer requires a free driver, also provided by TEAC. Supporting Hi-Res audio formats up to 5.6MHz DSD and 192kHz PCM, this free app for iOS and Android devices allows you to control wireless streaming music playback from a device, NAS, computers and the Internet, along with rich graphic information such as album artwork. * iOS version is available now. Android version is scheduled for later release. * Wi-Fi network is required to use the App.